Summary: For a no frills, all-round workout at a very low price, this elliptical cross trainer and bike is ideal for use in the home. The on-board computer will keep track of your progress and you can step up the intensity of your workout quickly and easily. This is one of the most popular items in the fitness equipment category at amazon.co.uk – with feedback from more than 700 buyers. Don’t expect commercial gym quality equipment in this price bracket – though you can expect a solid starter elliptical which also doubles as an exercise bike. Check out the product page for the latest amazon.co.uk discount. 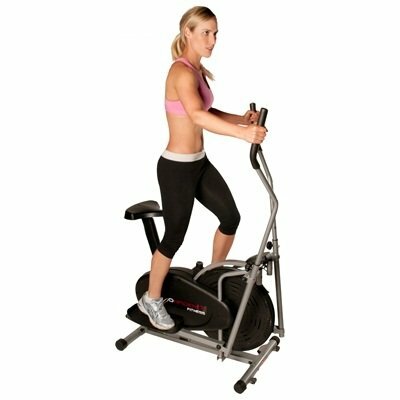 The Confidence 2 in 1 elliptical cross trainer and bike gives a total body workout within the comfort of your own home. This machine provides a low-impact, cardiovascular workout while also working those legs, hips, arms, shoulders and buttock muscles, all at a low budget price. With both forward and reverse motions you can emphasise a greater range of muscles, while adjustable resistance gives you the opportunity of increasing the intensity of your workout. This machine includes an on board computer which keeps a track of your workout, showing the amount of time you’ve spent on the machine, the speed of your workout, the distance travelled and the total amount of calories burned. You’ll also find a manual resistance adjuster, which you’ll simply twist clockwise to increase the resistance and in the opposite direction to lower the resistance. In comparison to similar pieces of equipment, you’ll find this in the lower price bracket, although both the on board computer and the resistance adjuster are on the more basic side. With both the elliptical trainer and the bike, you’re assured a wide range of workout options, especially with the opportunity to enjoy both forward and reverse motion. Reviews of the item are a little mixed. Some users claim to be completely satisfied with both the reliability and the price of the item, while the assembly of the equipment is seemingly straightforward. It was noted that the noise levels of the machine are particularly low, ideal for use upstairs or in a flat. A number of users have complained about the long term equipment failure however, so it seems that regular maintenance of the machine by checking all of the nuts and bolts periodically might be necessary. There is always an element of high expectations with the super-budget level of equipment – I do recommend that you take this into account when you review the comments. The Confidence 2 in 1 Elliptical Cross Trainer and Bike is an ideal piece of equipment for those who want a regular workout with the ability to mix up their training. At a budget price, this is ideal to get you started. Check out the picture gallery, feedback and latest discount for yourself now at Amazon.co.uk! PS: Just added a review of something completely different – the PedalPro Bicycle Fitness Trainer – this turns your regular bike into an exercise bike.